WEEKLY RECAP: Week 11 was an improvement in Head to Head with a decent 9-6 record - we missed on 3 of 4 upsets so that hurt the overall percentage compared to everyone else and we dropped to the 89th percentile after being in the 90s from Week 7 on. With the Spread however... well less said the better, our Week 11 record of 3-9 (with 3 pushes) was well... awful. We only got Miami getting 1.0 and Philly and Seattle giving a combined 15.5... and missed everything else! H2H UPSETS PICKED: NY Jets and Baltimore stunk it up on the road against Buffalo and Chicago, yet somehow stay in playoff contention. While we got Miami at home over the inconsistent Chargers but New England didn't get a call late and dropped their game on the road to Carolina. So 1 from 4 Correct for Week 11 (per Pick'Em favourite/underdog listing). H2H LESSONS LEARNED: Gotta respect EJ Manuel for the Bills... it was easy to forget he's been injured after a bright start and the Jets have Geno Smith so - we're idiots for picking them on the road. Baltimore got lucky last week against Cincy, not so much against the Bears in OT. Pittsburgh may not be woeful after all and Detroit are still inconsistent in big games, while Houston and Atlanta STIIIIIINK. Carolina get a favourable call late to beat New England, while Denver put Kansas City somewhat in their place. Credit to the Buccaneers and Oakland though - good wins. And hey - are Arizona decent? Really? I remember the buffet I had in Arizona once... I recall it being about as decent as they appear to be in 2013. 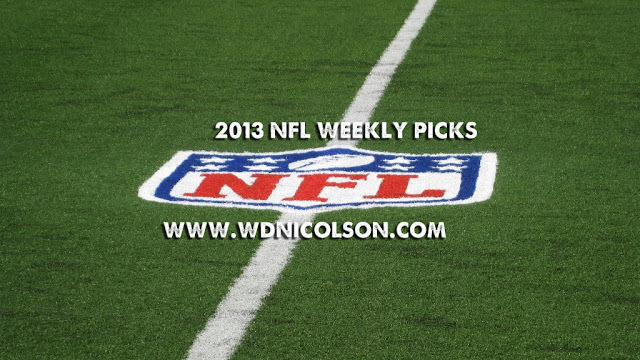 My 2013 NFL Season Preview and SuperBowl picks are here - and every week throughout the NFL in 2013 I will be posting my picks here on www.wdnicolson.com and via @wdnicolson. Last year in the Yahoo! Sports Pro Football Pick'em competition I managed to finish in the 98th percentile (so Top 2%) of tipsters across the world... completely surprising myself by using the rule of thumb I (for some reason) refuse to back entirely in my NRL Tipping (that is pick favourites and then pick favourites and then, and only then... pick favourites and maybe one or two gut picks - which doesn't hurt you as much with up to 16 NFL games a week v 8 NRL games). Week 12 begins with Atlanta hosting New Orleans on Friday (Australian time) - a game that looked sensational as the Thursday Nighter for the NFL Network entering the season but now... well not so much. TNF: New Orleans over Atlanta; Sunday: Pittsburgh over Cleveland+, Detroit over Tampa Bay, Green Bay over Minnesota, Kansas City over San Diego, Chicago over St Louis+, Carolina over Miami, Baltimore over NY Jets, Houston over Jacksonville, Oakland over Tennessee, Indianapolis over Arizona+, Dallas over NY Giants+; SNF: Denver over New England; MNF: San Francisco over Washington. New Orleans -9.5, Pittsburgh +1.5, Detroit -9.0, Green Bay -4.5, San Diego +4.5, Chicago +1.0, Miami +4.5, Baltimore -3.5, Jacksonville +10.0, Oakland -1.0, Indianapolis +2.5, Dallas +2.5, Denver -2.5, San Francisco -5.5. Quick Notes: Push city last week - and we're taking all up 7 teams with the points in Week 12. Good luck with that right? After all we went 3-9-3 last week... to drop back under .500 for the first time since Week 7. You can tweet me your NFL picks every week @wdnicolson and I will list my final picks from that account every Thursday Night. You can join the Pro Football Pick'em League I'm in here - which is a 'SPREAD' competition (Tony Kornheiser's Radio Show Group - so if you join best you are somewhat familiar with who TK is and possibly his radio show or PTI). | Group ID#: 35104 | Password: andy | Or just join the regular Pick'em Overall league. During 2013 I will be reading Peter King's 'THE MMQB' Website every week - I suggest you do the same.